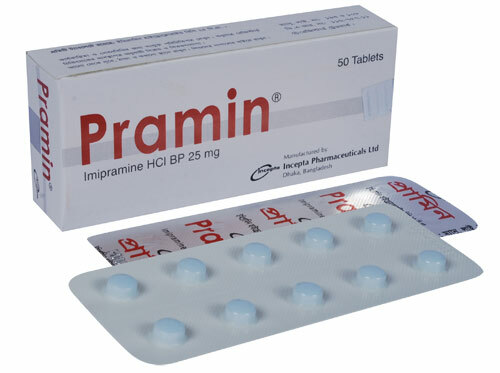 Pramin tablet: Each tablet contains Imipramine hydrochloride BP 25 mg.
Imipramine hydrochloride is a original tricyclic antidepressant, a member of the dibenzazepine group of compounds. The mechanism of action of Pramin is not definitely known. However, it does not act primarily by stimulation of the central nervous system. The clinical effect is hypothesized as being due to potentiation of adrenergic synapses by blocking uptake of norepinephrine at nerve endings. The mode of action of the drug in controlling childhood enuresis is thought to be apart from its antidepressant effect. Depressive illness, nocturnal enuresis in children. Depression, initially up to 75 mg daily in divided doses increased gradually to 150-200 mg (up to 300 mg in hospital patients); up to 150 mg may be given as a single dose at bedtime; elderly initially 10 mg daily, increased gradually to 30-50 mg daily; child not recommended for depression. Nocturnal enuresis, child 7-8 years 25 mg, 8-11 years 25-50 mg, over 11 years 50-75 mg at bedtime; max. period of treatment (including gradual withdrawal) 3 months-full physical examination before further course. The most frequent of side effects are dry mouth, constipation, urinary retention, increased heart rate, sedation, irritability, dizziness, and decreased coordination. Dry mouth, if severe to the point of causing difficulty speaking or swallowing, may be managed by dosage reduction or temporary discontinuation of the drug. Imipramine usage has been linked to both increases and decreases in blood pressure and heart rate. Heart attacks, congestive heart failure, and strokes have been reported. Confusion, disorientation, delusions, insomnia, and anxiety have also been reported as side effects in a small percentage of people taking imipramine. Problems associated with the skin (loss of sensation, numbness and tingling, rashes, spots, itching and puffiness), seizures, and ringing in the ears have also been reported. Nausea, vomiting, loss of appetite, diarrhea, and abdominal cramping are all side effects associated with imipramine usage in a small number of people. Imipramine should be used cautiously and with close physician supervision in people, especially the elderly, who have benign prostatic hypertrophy, urinary retention, and glaucoma, especially angle-closure glaucoma. The sedative effect is increased when imipramine is taken with other central nervous system depressants, such as alcoholic beverages, sleeping medications, other sedatives, or antihistamines. Imipramine may increase heart rate and stress on the heart. It may be dangerous for people with cardiovascular disease, especially those who have recently had a heart attack, to take this drug or other antidepressants in the same pharmacological class. Older people and persons with a history of heart disease may develop heart arrhythmias, heart conduction abnormalities, congestive heart failure, heart attack, abnormally rapid heart rates and strokes. Until a therapeutic dosage has been determined, people starting imipramine should be closely watched for signs of suicide. The risk of suicide is increased when imipramine is taken in overdose or combined with alcohol. Manic episodes and the emergence of symptoms of pre-existing psychotic states have been reported when imipramine therapy is started. Pregnancy category D. Limited data suggest that imipramine is likely to be excreted in human breast milk. Known risk of damage to fetus.